Peter Frankopan (Oxford) offers an unexpected historical account in The First Crusade: The Call From the East (HUP 2012) which emphasizes the eastern causes of the conflict. The publisher’s description follows. According to tradition, the First Crusade began at the instigation of Pope Urban II and culminated in July 1099, when thousands of western European knights liberated Jerusalem from the rising menace of Islam. But what if the First Crusade’s real catalyst lay far to the east of Rome? 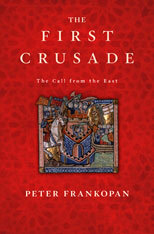 In this groundbreaking book, countering nearly a millennium of scholarship, Peter Frankopan reveals the untold history of the First Crusade. Basing his account on long-ignored eastern sources, Frankopan also gives a provocative and highly original explanation of the world-changing events that followed the First Crusade. The Vatican’s victory cemented papal power, while Constantinople, the heart of the still-vital Byzantine empire, never recovered. As a result, both Alexios and Byzantium were consigned to the margins of history. From Frankopan’s revolutionary work, we gain a more faithful understanding of the way the taking of Jerusalem set the stage for western Europe’s dominance up to the present day and shaped the modern world. This is fascinating! Thank you for calling attention to this source. I wish this book had been available when I was teaching the First Crusade — though, as is typical, the publisher’s blurb oversells the thesis. There has been plenty of scholarship that has focussed on the role that Alexios and the Eastern Church played in the launching of the First Crusade. One area of scholarship that was sorely lacking in my day (though perhaps things have changed in the last decade) was the impact of changing political dynamics in the Levant, and how they acted as a catalyst both in the Eastern Roman Empire and the “New Rome” of the 11th century papacy. Thanks for the hat tip — I look forward to the read.